You've been eating less, counting calories, and exercising like crazy -- shouldn't you be skinny by now? If you're not, diet and exercise may not be the weight-loss answer you need. In Clean, Green, and Lean, you'll find out how the toxins in your food and all over your house can make you fat and keep you that way. This book clearly shows you how to clean out your system and your home to lose weight and feel great in just four weeks. Want to lose weight without starving yourself, counting calories, or following a complex meal plan? Would you like to look and feel stronger and healthier than you have in years -- exercise optional? How about transforming your health in just four weeks and helping to save the planet in the process? 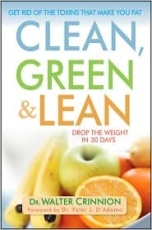 Find out how by reading Clean, Green, and Lean. Filled with inspiring, true-life stories of people who have lost weight, healed their bodies, and turned their lives around following Dr. Crinnion's four-week plan, Clean, Green, and Lean is the groundbreaking book you need to slim down, clean up, and start enjoying life again.